Thanks for keeping me inside and using flea control on me. Better known as feline infectious anemia, hemobartonellosis can affect any cat exposed to fleas or ticks. Exposure might not bother a healthy cat, but cats with weak immune systems or suffering from serious diseases can become very sick or die. Protecting Kitty from coming down with hemobartonellosis isn't that difficult. Hemobartonellosis is caused by the bacteria Mycoplasma haemofelis. This parasite invades and destroys Kitty's red blood cells. Cats can pick up the organism through flea, tick or mosquito bites, cat fights or any situation where there's an exchange of blood from an infected carrier. It takes approximately a month from the time of exposure until Kitty comes down with any noticeable symptoms. While any cat can potentially come down with the disease, it most often strikes unneutered male cats who roam outdoors. Cats with mild cases of hemobartonellosis might not show any symptoms. 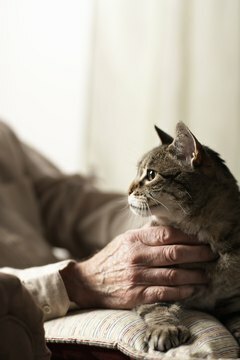 In more severely afflicted cats, or those who also suffer from feline leukemia, symptoms of feline infectious anemia include appetite loss, lethargy, rapid heartbeat and breathing, along with sensitivity to touch due to body tenderness. Cats might exhibit jaundice, or pale or yellow mucous membranes. Some cats might run a high fever. That's actually good news, because the temperature of dying anemic cats drops sharply. Badly affected cats might also go into shock. Diagnosing hemobartonellis in cats isn't easy, especially right after exposure. Your vet needs the results of Kitty's complete blood count, along with his feline leukemia or feline immunodeficiency virus status. If your vet diagnoses feline infectious anemia, she might prescribe antibiotics or the steroid prednisone. If Kitty's anemia is severe, he might require a blood transfusion. Most cats recover with treatment, but remain carriers for the rest of their lives. That also means that stressful events -- such as moving, new people or pets in the household, or anything that disturbs Kitty -- can bring on a recurrence. According to the Merck Veterinary Manual, approximately one-third of cats seriously affected by hemobartonellosis will die without veterinary treatment. The best way to prevent Kitty from coming down from feline infectious anemia is by keeping him indoors and using topical monthly flea and tick preventives on him. Not only does making him an inside cat protect him from hemobartonellosis, but he also won't be exposed to other harmful viruses from other felines or wildlife. Make sure to feed him a healthy diet to keep his immune system strong. Take him to the vet for annual check-ups.